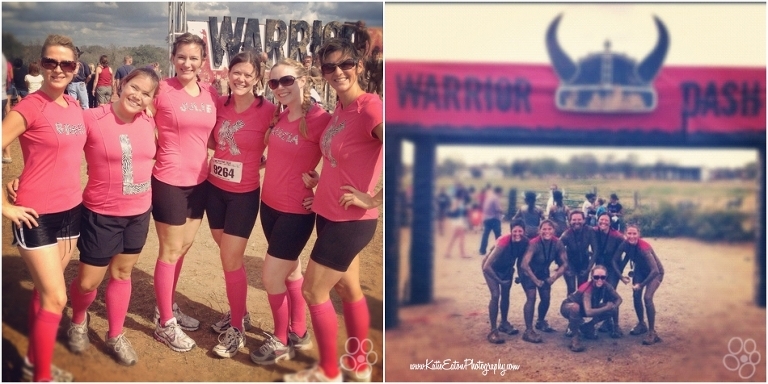 A month or so ago, my girlfriend Julie texted a handful of friends with this really great idea — the Warrior Dash was on groupon. She was like, “hey, let’s all run this together … could be super fun.” And then a slew of texts followed — and by slew, I mean, 100’s of texts. There was discussion of running over fire (which I thought was a joke) and getting muddy, blah blah blah. I figured, sure, this will be fun. I’m embarrassed to say that this was the first ever groupon I ever purchased so I needed major handholding. So, after I finally figured out how to actually buy a groupon I remembered that JT ran this same race last year … and the photographs were absolutely the most disgusting I’d ever seen. By the time he finished, the only spot that wasn’t covered in mud was his face. My poor sister, I called her up and convinced her to run and I think she had no idea what nastiness was ahead of us. Fast forward to a week or so before the race … the details of the race started, the outfit discussion (yes … we most certainly did match with pink knee highs and pink shirts), what were we going to drink before/during and after the race, who was willing to sacrifice their vehicle for nine muddy women, etc. I was so excited for a weekend off … it was my first Saturday off since the middle of August. I almost forgot what it was like to sleep in on a Saturday … and lounge in my pajamas! I simply must remember to take a Saturday or two off next fall! We all met at my house with our bags of goodies — extra clothes and shoes and gallons of water to pour on ourselves after the race, old towels, adult beverages, etc. We relied on the kindness of strangers to take the group photographs with their phones and text them to us because there was simply no way I was schlepping my equipment to this mud pit! There were twelve total obstacles all along a three mile route — we climbed under barbed wire, army crawled under planks, climbed two dirt walls, ran up and down steep mud hills, climbed one climbing wall with water spraying at us from above and the side, swam in nasty water from one floating dock to another, balanced on six inch boards that were uneven and ten feet above the ground, we climbed a two story rope wall, ran three hurdles over fire and then finished with a swim in the mud. 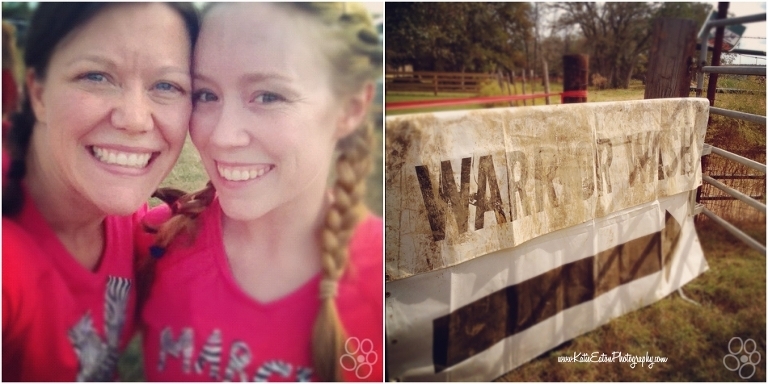 I tried to skip that last obstacle — I really did … but peer pressure made me do it. 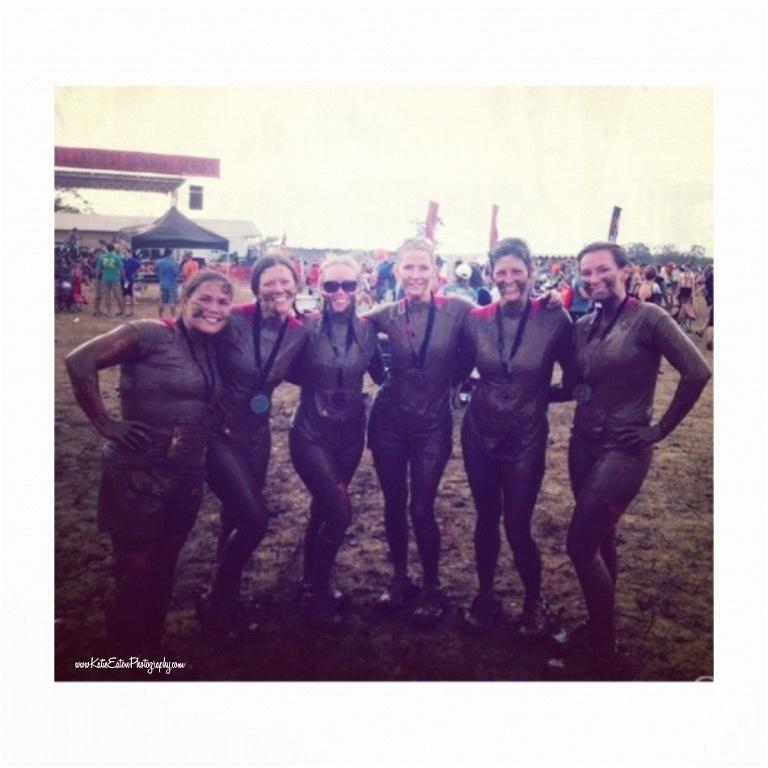 There was barbed wire above us so we had to be in our bellies in the mud. And we looked exactly as I remembered JT’s photograph … we were completely covered in mud except our faces. We only have a handful of photographs to remember this run … but I don’t think we’re going to need them to help us remember it! I will forever remember jumping off one of those floating docks thinking the water was waist high only to discover that it wasn’t … and several seconds too late. I had mud coming out of my ears for days! Indeed I did. I’ve met some amazing women since this summer! They have literally welcomed me and my family into their friend group with open arms. There aren’t many women who are that inviting once you reach a certain age … it’s almost as though, after your 30’s, people have their friends and there isn’t room for many more but as Sabrina has moved into a new school and has new friends, the same has been true for me. I’m so very lucky that Julie introduced herself to me at the gym early in the summer! We quickly discovered her husband and I went to high school together … and that our girls were going to be in kinder together … and that she lives one street away from us … and the rest, they say, is history.